Uh! El más difícil todavía! Making a GOOD paella is much more difficult that it seems, although here’s perfectly explained. P.S. : What about the onion? I would like to try Paella!! I will ask my parents if they can make it. Me ha llevado toda la tarde conseguir explicarlo. Bufff. Making GOOD Paella is very difficult. I know it. 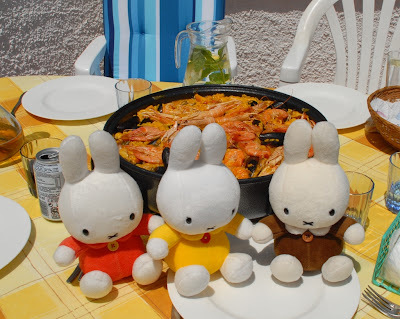 But the point is the rice and surely at Cafemiffy they will soon master paella rice cooking. PS: We do not use onion. 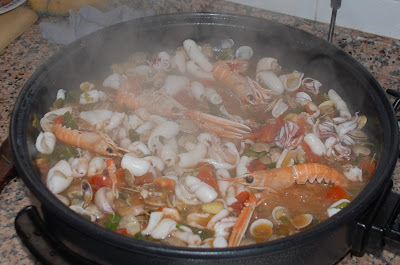 I must say that normally you do, specially in Catalonia, but we think that using onion or sugar (somepeople use it) is not a good idea when cooking a seafood paella. I am sure that your parents will do an excellent one. And we will ask our friend katanga – who made an excellent artwork for Miffa and your sisters sailing cup- to explain her secret recipe. PS: Katanga ABSOLUTELY NO MEAT!! !